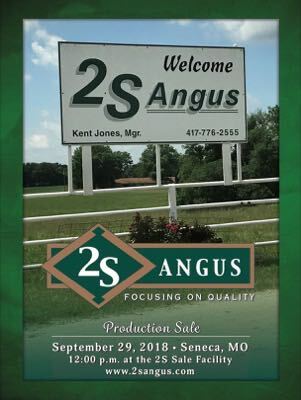 Welcome to 2 S Angus, a family owned and operated registered Black Angus seedstock operation located on the Missouri-Oklahoma border southwest of Joplin, Missouri. 2 S was founded in the late 1980's and today's 2 S Angus operation is the result of over 20 years of investing in and producing breed-leading genetics; managing those genetics with extensive use of artificial insemination and embryo transplantation; and, building a herd with disciplined use of AHIR performance data. The 2 S commitment is to "produce cattle with good structure, eye appeal, and docility that excel in economically important traits documented through performance measurement outcomes". Our goal is to produce bulls that will make cow-calf producers more profitable and females that will continuously improve Angus genetics in registered and commercial herds throughout this region. We value the relationships with our customers and we are committed to providing great customer service. We invite you to join us for our annual production sale the last Saturday of September each fall. The sale is held at the 2 S Ranch Sale Facility. Our next sale will be September 29, 2018 (see Annual Production Sale page for 2017 sale results). If you are in our area and would like to evaluate the sale cattle, see our herd sires, or just visit about cattle, we hope you will stop in. You are always welcome! We are located on Hwy #43, seven miles south of I-44 and four miles north of Seneca, MO.